RABO's products have been designed to achieve the highest level of Play Value, Quality and Safety. 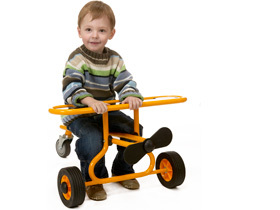 Ergonomic scale and proper anthropometrical dimensions in our tricycles provide for children's natural need for stimulation of motion and balance experiences, eye-hand coordination, social interactive opportunities, as well as, development of gross and fine motor skills. 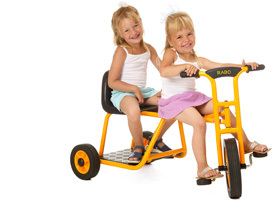 RABO Tricycles contain a blend of modern, timeless design, quality and exceptional play value. 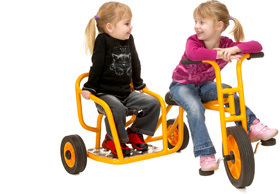 Children's developmental need for stimulation of motion and balance experiences, eye-hand coordination, as well as development of gross and fine motor skills occur on RABOs broad range of wheel-based products. Some products recognize and support toddlers' natural desire to favour parallel play. Others cater to preschool and elementary aged children's ability with friends to cooperate in order to operate the cycle, supporting their development of social-interactive and language skills. A careful choice of smooth, lightweight, durable materials balanced by superior design features ensures the ultimate opportunity for a child to venture out on wheels. Observations show that children's motivation to spend a maximum amount of time on wheels is directly associated with the smooth ease of riding. RABO designed cycles attract children to engage in added physical activity and exploration due to its smooth, lightweight design.